In a world ruled by fierce warrior queens, a grand empire was built upon the backs of Phoenix Riders - legendary heroes who soared through the sky on wings of fire - until a war between two sisters ripped it all apart. Sixteen years later, Veronyka is a war orphan who dreams of becoming a Phoenix Rider from the stories of old. After a shocking betrayal from her controlling sister, Veronyka strikes out alone to find the Riders - even if that means disguising herself as a boy to join their ranks. Just as Veronyka finally feels like she belongs, her sister turns up and reveals a tangled web of lies between them that will change everything. And, meanwhile, the new empire has learned of the Riders' return and intends to destroy them once and for all. 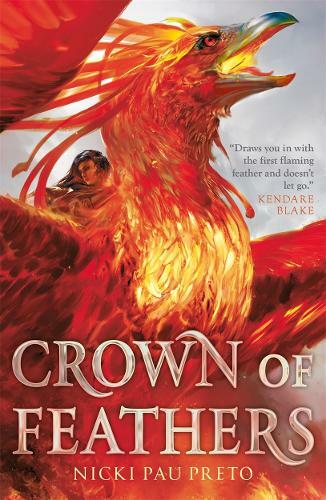 Crown of Feathers is an epic fantasy about love's incredible power to save - or to destroy. Throughout is interspersed the story of Avalkyra Ashfire, the last Rider Queen, who would rather see her empire burn than fall into her sister's hands.